Oktoberfest in August kicked off the 2013 Oktoberfest season. The event is sponsored by the Schwaben Athletic Club, a German club that adds authenticity to the event. This Oktoberfest was held on the same grounds as last year and again with the same police presence to insure order. Parking was easy and free. Admission to the event was $5 and a quick ID check and you were in. My friends and I arrived around 8:30p which was a little later than last year. This was because we spent the day at the Arlington Race Track watching horse racing (which was a regular occurrence at Oktoberfest from its beginning through 1960). Once inside the gates we looked around the venue a little bit. The big tent from last year was there as well as all of the seating on the inside and out. There was one main food tent and the beer and other beverages were found at the back of the big tent. Prices for food and drink were the same as last year. We started out with a pitcher of Spaten Lager for $14. Everything is done by a ticket system where you buy tickets then exchange them for food and drink. It is a slight hassle but I understand why it is done and I have no problem with it. For dinner I had a Thüringer sandwich as well as a bratwurst sandwich. The Thüringer sandwich was good, on par with last year. The bratwurst was only ok. I would have expected a better tasting brat from a German club. The pretzel was only ok as well; it surprisingly lacked salt and was a little hard since it looked as if it were sitting out all day. The sauerkraut was good but the potato salad was lacking. Alte Kameraden performed last year and were again a delight. They are highly entertaining and they have very good crowd engagement. They did do the snake through the crowd which I was able to join in this year and it was a lot of fun. Unfortunately for us, they were only on until 9:00p then they were followed by The Fidelen Kircheimer from Germany. Last year Suburban Cowboys finished off the night and I recommended in my post that they try and stick to a German-only entertainment lineup. This year it seems like they took my advice but I was sadly disappointed. 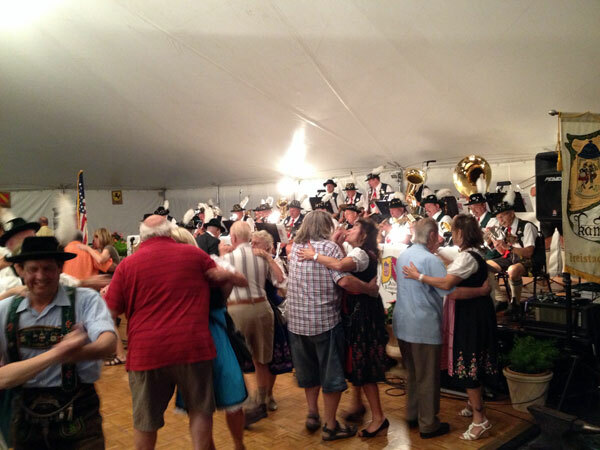 The Fidelen Kircheimer was a traditional oompah band and I would have liked to hear more upbeat songs after 9:00p. I don’t know if it is a result of the band but the crowd started to dwindle after 9:00p and my friends and I only stayed until about 10:00p. The event was very similar to last year which wasn’t bad but at the same time I didn’t see much improvement. The addition of The Fidelen Kircheimer was a good try but unfortunately they fell short. I will still attend next year since Oktoberfest in August kicks off my Oktoberfest season but I will probably go in with less high hopes. This Oktoberfest is a decent event but I have a feeling they are set in their ways and don’t really want to change it up all that much. A more upbeat German band to close the night would be a great addition. Maybe they will surprise me next year.